Some quiet time with kitties. I had some home visits tonight. I’ve met a lot of pets – mostly cats and dogs – and it warms my heart that these little children are getting the chance to care for something that either loves them with such loyalty (dogs) or wonders why that little person isn’t carrying food (cats). I always like going home to my own crew. 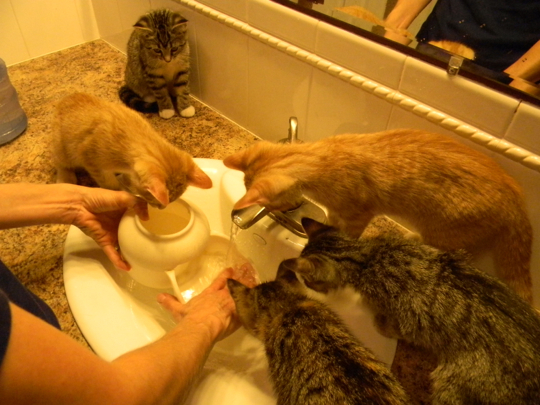 Tonight I was washing my hands in the bathroom and the boys lept up to see what was going on. That’s so weird, since as babies their fascination with water was well-documented. Now they are older. Ralph is still thirsty. Wally is still stupid. Emme is….. well, she’s Emme. And they are all bigger. Awwwww! They are so cute….as kittens & as cats! I watch a show on Animal Planet called “Too Cute!” You should send in some of the antics of these guys.